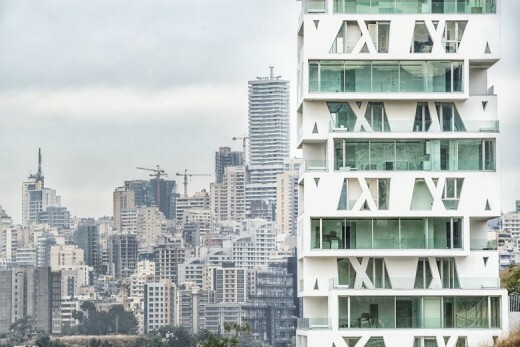 The construction of the residential tower The Cube in Beirut is finalised. 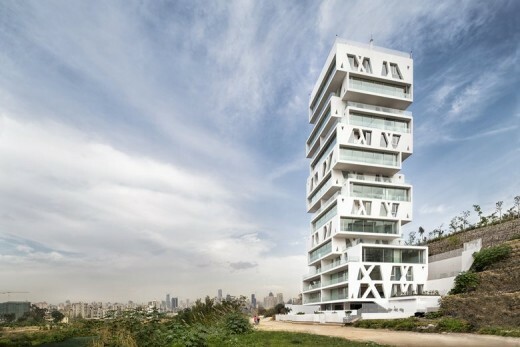 Orange Architects designed the iconic tower for the Lebanese development corporation Masharii. 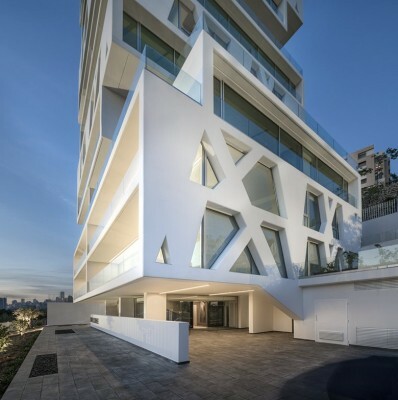 The Cube is located on a prominently visible location on Plot 941 in Sin el Fil, an eastern district of Beirut, Lebanon. 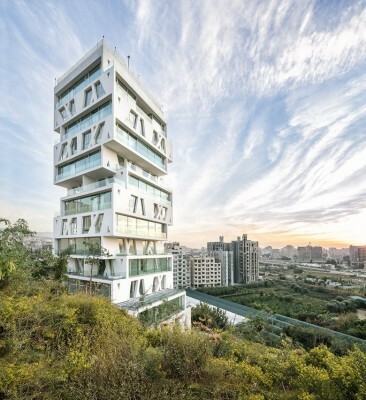 The concept of the 50 meter high tower is simple but extraordinarily effective: ‘MAXIMIZE’; making optimal use of the client’s wishes, the site’s potential, the local building code and the fantastic views on Beirut and the Mediterranean. 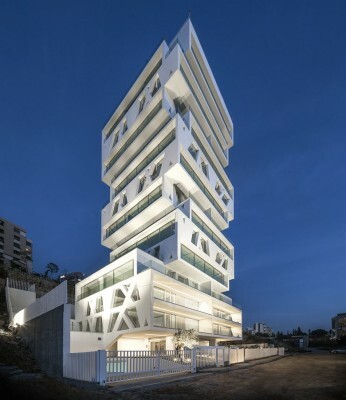 The Cube is presenting a whole new level to the concept of high rise, or the architecture of towers. 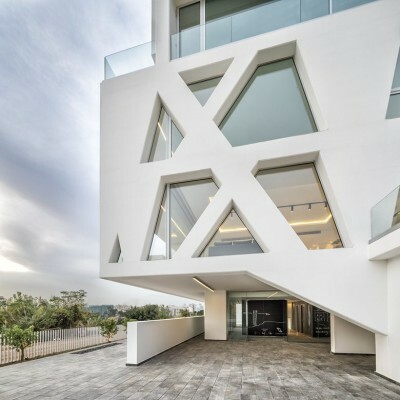 No extrusion of a singular floor plan, but a unique and iconic sculpture of individual villas, all with perfect views on the cityscape of Beirut. 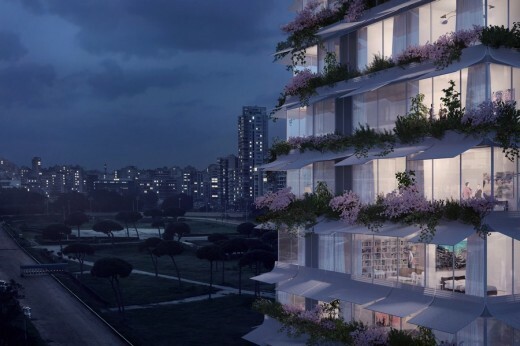 The rotation of the volumes on each level offers residents magnificent outdoor areas on the roof of the apartment below, as well as panoramic windows up to 12 meters wide. Each level consists of one or two apartments. 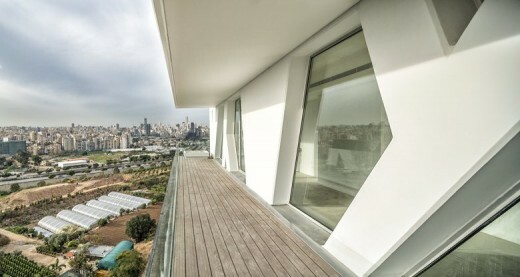 The single apartments have the fabulous opportunity to enjoy Beirut from a 360 panorama. 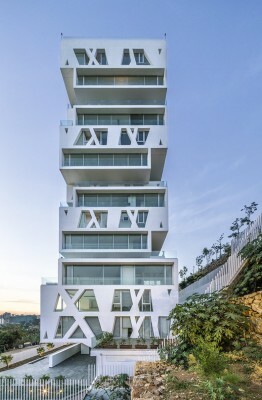 The design with the 14 stacked and rotated floor plans generates 19 attractive apartments in total, ranging in size from 117 to 234 m2, with fluid spaces, large balconies and wall to wall window frames. 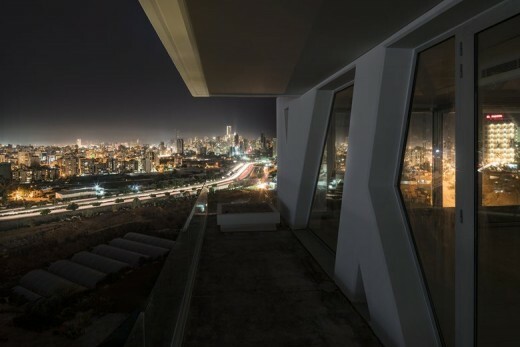 With its freestanding setting on the edge of the city both the view on the Cube itself and on central Beirut are unseen; the vibrant City is your personal wallpaper, day and night. Thanks to the fixed core with lifts and staircases at the heart of the building, there are no constraints on the layout of the apartments. 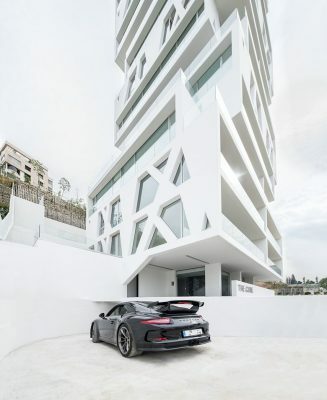 The floors run straight from the core to the facades, which are on each floor composed of two supporting concrete girders and two panoramic window frames, consequently rotated 90 degrees per level. Both the crossing girders and the core serve to stabilize the tower, an extra challenging task in a seismologically active area. The white coated girder walls, which are perforated, strongly determine the appearance of both the exterior and the interior of the building. The parking garage is located underground in 3 layers and partly set into the adjacent hill. On the ground floor the recessed space for the lobby is covered by a spectacular cantilevering volume, creating a nicely covered place and marking the generous entrance of the Cube.